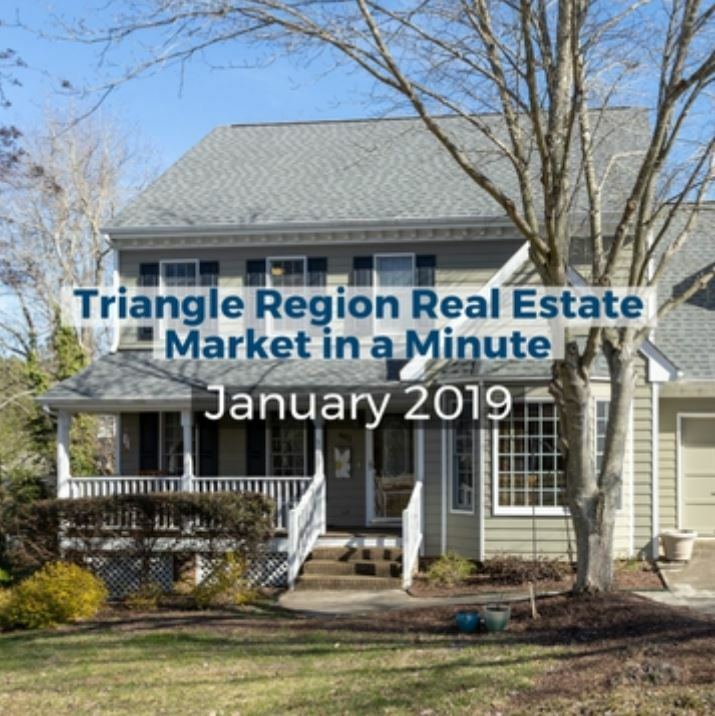 The February real estate numbers are in for Wake County. 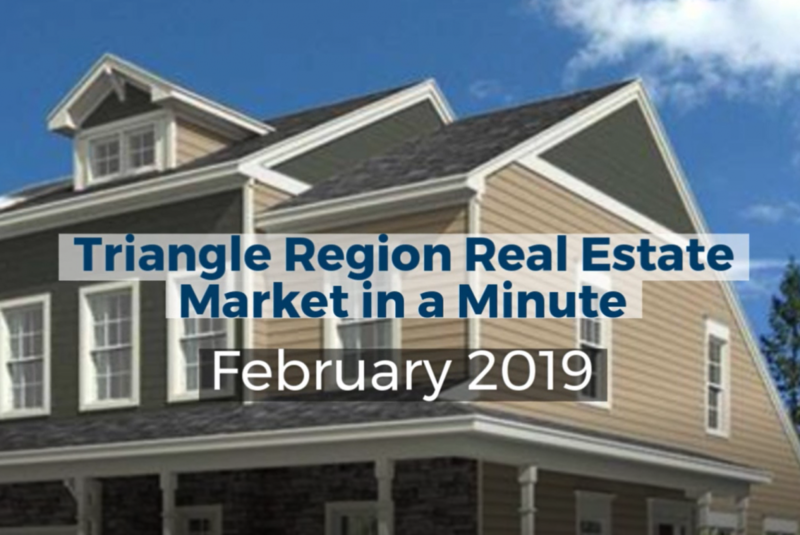 January and February started off very slowly and most real estate followers feared the coming of a real estate slowdown. How did we do in February? Find out here! Author kellyjPosted on March 29, 2019 March 29, 2019 Categories Community Focus, In & Around the TriangleTags apex nc, cary, cary nc, cary north carolina, raleigh, Raleigh eventsLeave a comment on Spring has finally Sprung! Over the past several years, the Raleigh-Durham-Chapel Hill area has become a mecca for local breweries. Across the Triangle area, there are 25+ breweries with open barstools waiting to be checked out! From IPAs, Stouts, Porters to Pilsners here are plenty of great options. 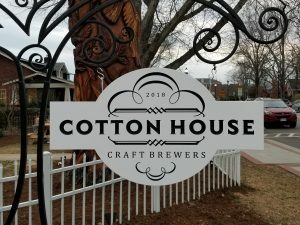 This week, Kelly and I decided to check out a new brewery in the heart of downtown Cary, the Cotton House Craft Brewers. 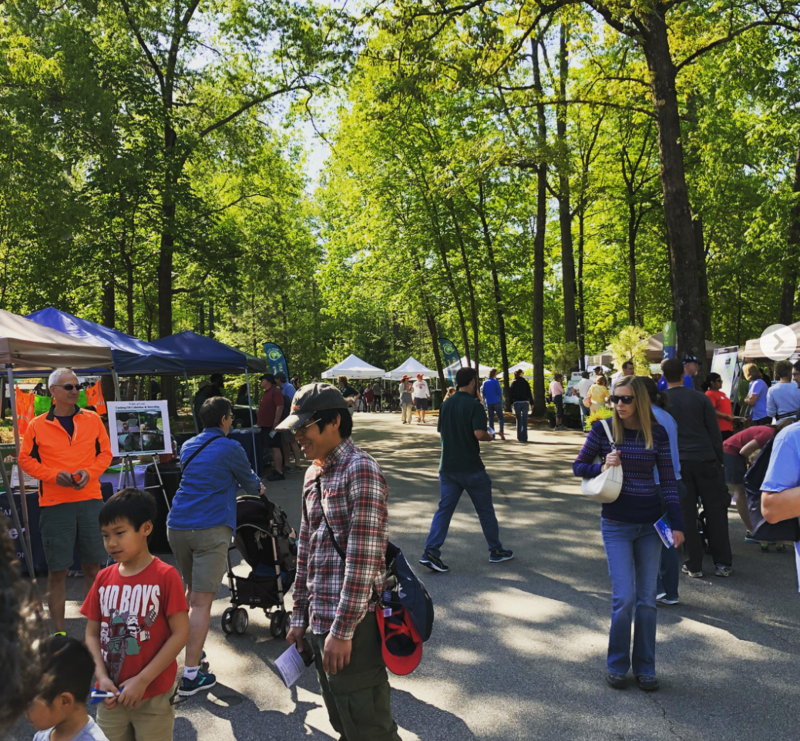 Downtown Cary is a vibrant destination featuring the Mayton Inn, the Downtown Park, the Cary Arts Center and the soon to be renovated Cary Community Library. The Cotton House is one of the newest businesses to call downtown Cary home. The Cotton House has a different look and feel than most breweries in the Triangle. The taproom is located in a historic house, The Pasmore House, a registered National Historic Site built in 1900. The house features an expansive front porch with high back rocking chairs perfect for sipping a finely crafted beer while greeting the passers-by on Academy Street. Inside, there is a room that resembles a turn of the century formal parlor. This room features period style furniture with an original brick fireplace. This room is a great place to relax and enjoy conversation with your friends. The taproom includes a 25-foot prohibition-era style bar with a stunning Italian marble top. There is also a large back deck with views of the Cary downtown fountain and the new library complex. The Cotton House focus is on a limited release of beers. Kelly and I both sampled the Hazy Days IPA, while I opted for my second round to go dark with the Houndstooth Stout. Both were delicious! The stout, while dark, was not overly heavy and the IPA is sure to get my taste again on a future visit. 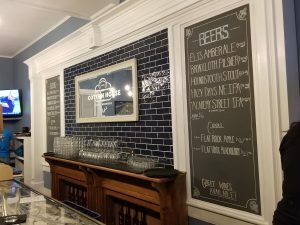 One of the unique features of the Cotton House that separates itself from other taprooms around the Triangle is that the bar menu features selections from Mayton Inn next door. The owners also plan to offer a selection of rotating food trucks. 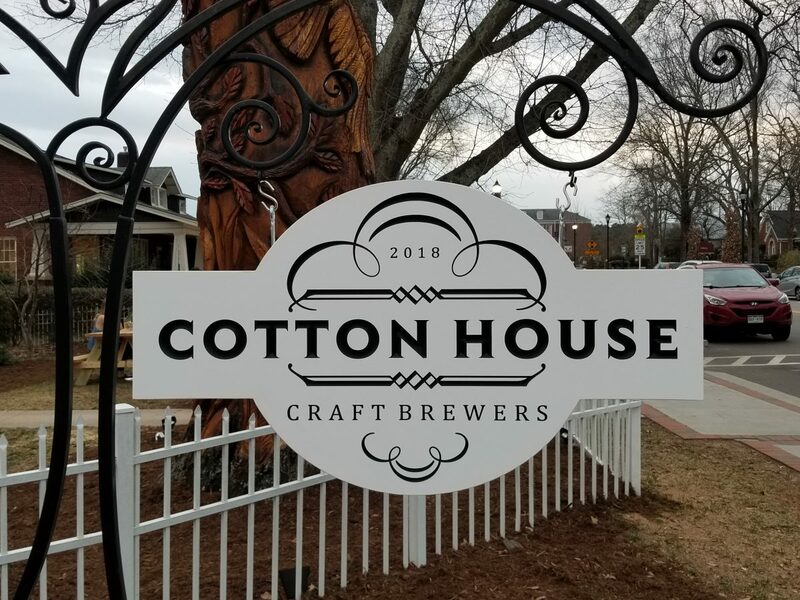 The Cotton House is a great addition to the Raleigh, Durham & Chapel Hill beer scene and if your travels find you in downtown Cary, the Cotton House is definitely a tap house that you should check out. I know that I will definitely be back again! I enjoy exploring when I’m out of town but typically resort to the “same old places” when I’m home. However, a recent conversation led me to step outside of my usual #itp favorites and I’m so happy that I did! Please do yourself a favor and make plans now to stop by the Mayton Inn. Whether you go for a drink, a meal or a weekend staycation, you will fall in LOVE! After enjoying a delicious dinner with friends at The Mayton Inn, I had the privilege of meeting the owner, Deanna Crossman and her adorable sons. She is charming, passionate and focused on creating a memorable experience. 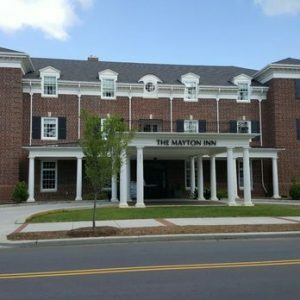 She currently owns two other hotels but you can tell The Mayton Inn and downtown Cary hold a special place in her heart. 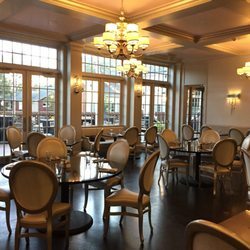 The Mayton Inn is a 45-room boutique hotel in the heart of downtown Cary. 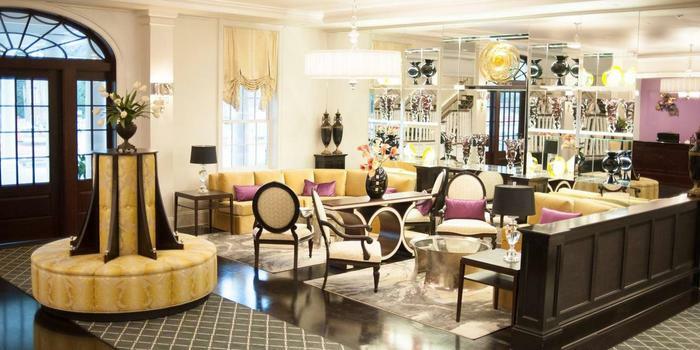 The Georgian-style hotel has something for everyone and boasts a lounge, full bar & restaurant, event spaces, and an outdoor terrace. There is also a high tech gym facility and spa rooms for guests. We were introduced to several members of the staff and they were all welcoming and helpful. 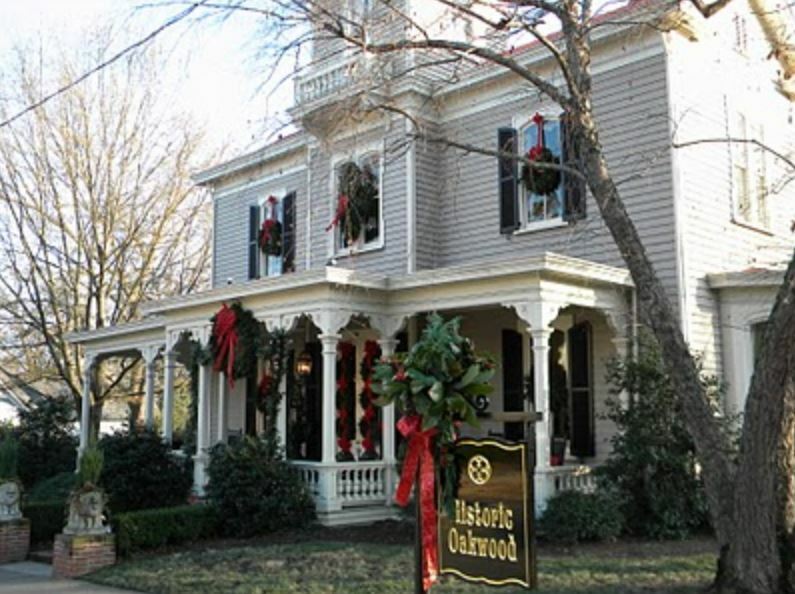 This inn is the PERFECT setting for a wedding, corporate event, gala or even just a night on the town! The hotel was designed to allow for many uses and offers beautifully appointed spaces both inside and out. 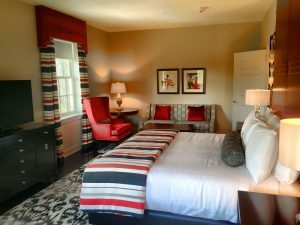 Walking through the curated rooms and suites, it’s hard to tell if the Mayton is a stunning, historical building or gorgeous new construction. It has a sense of timelessness that adds to the experience. Carolina blue skies over the newest boutique hotel in town! The attention to detail is phenomenal and can be seen in the way the colors, the fabrics and the lighting all come together to set a specific mood. The oversized terrace is ideal for enjoying our wonderful North Carolina weather and catching up with friends. They hold various events throughout the year to attract various guests and establish themselves as a destination and I can’t wait to see what’s next! Whether you’re planning a special event, looking to impress out-of-town guests or just want a unique experience close to home, you MUST stop by The Mayton Inn. You will NOT be disappointed! A new year brings much excitement and anticipation, but could 2019 be the year for a new home? Here are some quick New Year’s Resolutions to help you buy a home in 2019. Instead of just thinking about saving, why not start the new year off right with a resolution to jump-start your savings and start putting away more for your down payment on your first home? 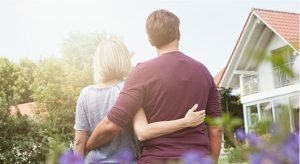 If you’re worried that the traditional 20% down payment may be too difficult to save in a year, there may be additional mortgage options that don’t require that amount. Resolution: Ditch the daily Starbucks run and boost your savings! Have you checked your credit report? If not, you should do that right away. Many credit reports contain errors and you will need time to have those mistakes removed. Your credit score is a very important variable that lenders consider when deciding on your mortgage loan. To make sure you get the best possible rates, it is never too early to start improving your credit! Resolution: Check your credit score! Your debt-to-income ratio is an important factor for lenders. To help you achieve a favorable rate, focus on paying down your existing debt as much as possible. This new year commit to paying more toward credit card debt, student loans, medical debt, and other debt streams. 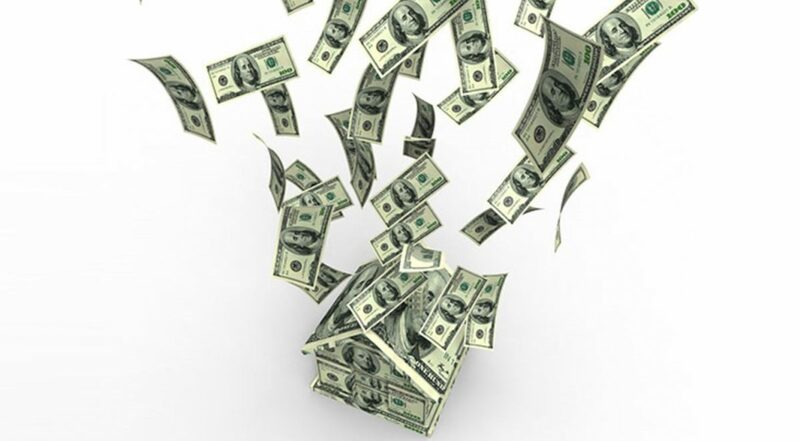 With fewer dollars owed, you will be in a better position to afford a mortgage once you buy a home! Resolution: Brown bag your lunch and put the savings toward your debt. Buying a home on your own is no easy task, which is why most home buyers opt to utilize the talents of many professionals along the way. The new year is the perfect time to start thinking about building the home buying dream team that can help you find your home and pay for it too! 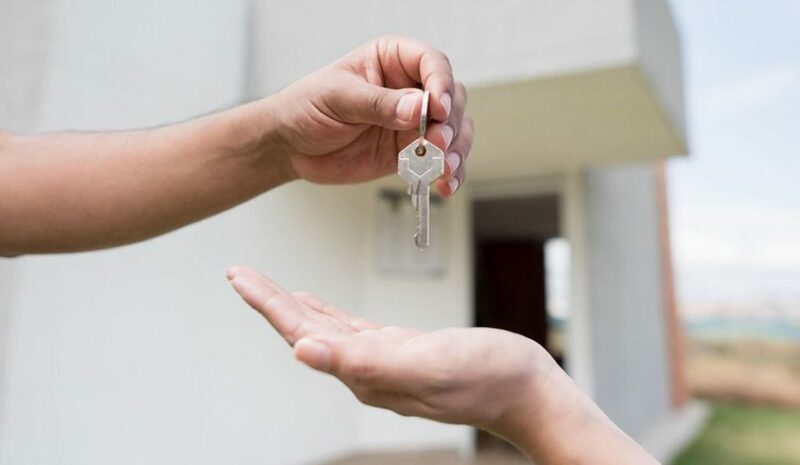 Your team should include an experienced real estate agent that can guide you through the process and a licensed loan officer that can assist you with all of the intricacies of the mortgage process. 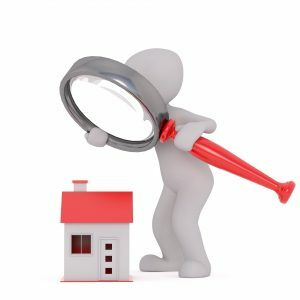 Your real estate agent can also assist you with home inspectors, general contractors and a real estate attorney that can assist with repair negotiations and with your home closing. Resolution: Commit to finding an experienced real estate agent and lender that can guide you to finding your new home! 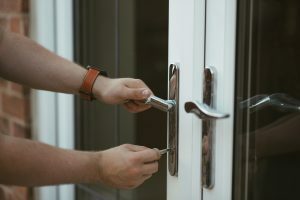 If you are planning to buy a home in 2019, now is the time to commit to your home purchase! With a few simple resolutions, you could be living in your dream home this year! We hope you have a very happy and prosperous New Year! 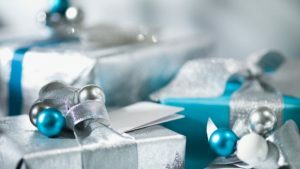 Is it time to put a house on the holiday Christmas gift list? Turkeys and tinsel, dreidels and pumpkin pie. 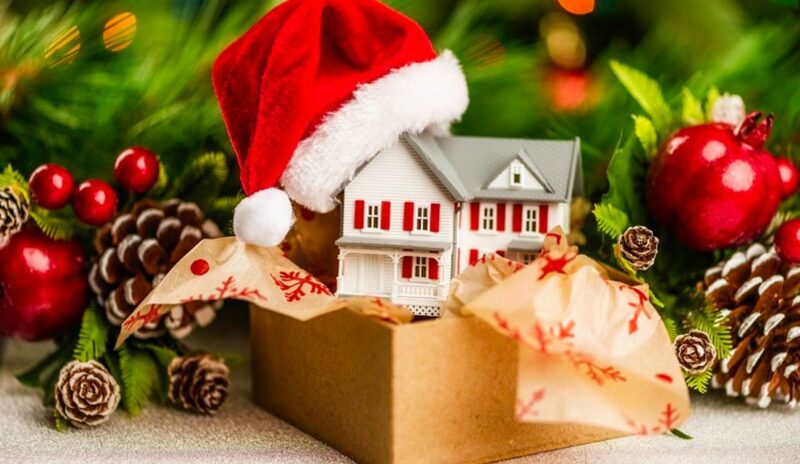 Yes, friends, the holidays are here again, and it’s the perfect time for … house hunting? OK, we know you’re busy enough planning family feasts and much-needed vacations while dealing with blustery weather, but hear us out. 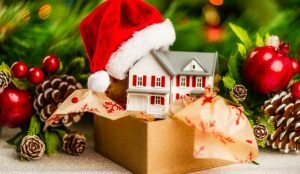 While it might seem counterintuitive to put a big-ticket item like a home on your holiday shopping list, it really does make sense. There’s typically less competition during the offseason, which means buyers can get more bang for their buck. About 40 percent of homes on average are sold in May, June, July, and August, according to The Housing Wire. The four months with the lightest sales are November through February, which means less competition as well. Research from Zillow shows that those who buy a home during the peak selling point usually pay an average premium of $1,500, but those who purchase homes in, say, December paid $3,100 less than average. Whether a house has been on the market for months or the “for sale” sign has recently appeared in the yard, sellers tend to be serious during the offseason. 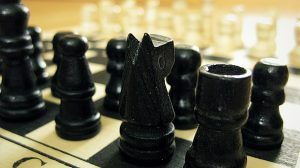 They are usually ready to make a deal, which means that buyers have more room for negotiation and throwing out a lower offer. Yes, I said it! Taxes. Right after the holiday season comes Tax Season! 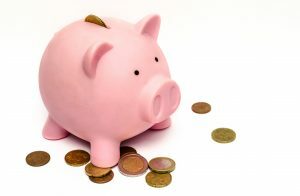 In case you weren’t aware, buying before January 1 can help you save in April and beyond. 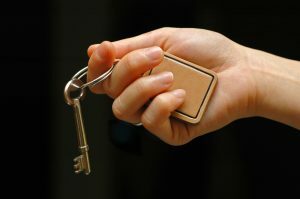 Homeownership can bring numerous tax perks, from deducting mortgage interest to property taxes. 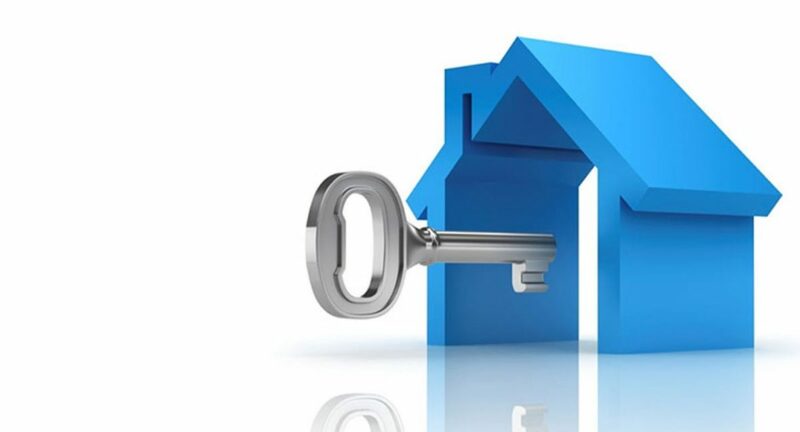 • During the warmer months, real estate agents, mortgage lenders, title companies and other professionals tend to be swamped, which means that clients might not always get the attention they need or want. • Once the summertime sales are made, buyers may receive more attention from the experts and experience fewer delays and service issues. Need new furniture or other items for your new home? 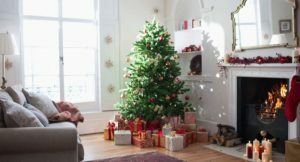 Plenty of seasonal clearance sales will be available to help you apply a personal touch – but be careful not to spend yourself into unrecoverable debt. 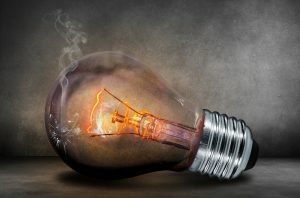 Obviously, you should never rush into a major purchase just to save a couple of dollars; and please remember to make any large purchases AFTER you close on your home.